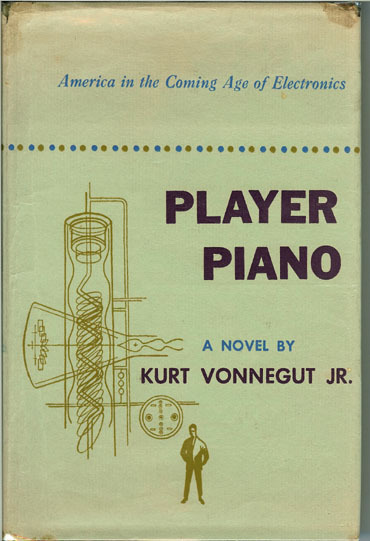 Kurt Vonnegut’s Player Piano is a satirical dystopic novel from 1952 that poked fun at the automation mantras of companies such as General Electric. The book portrays a society where increasing automation of work by machines has lead to an incredibly harsh societal divide. The small population of managers and engineers run the factories, monitoring the output of machines from control hubs and involving themselves in the bureaucracy of navigating information systems. Only a very few go through the right channels in higher education to be in this elite group that run the output of the country. Everyone else works for the state as a part of the government work crews. The mangers and engineers live lavishly, geographically separated from the rest of the population whilst everyone else lives in the ‘Homestead’, supported by the state just enough to get by. Those who work for the state crews are shown to be highly skilled machinists, innovators, inventors, intellectuals and artists. They’re people who want to work, to ply their craft, yet find themselves deemed useless in this highly mechanised society. What I particularly enjoyed about Osborne’s speech was pointing out how many jobs are being created with a tone indicating that there’s certainly no excuse to be unemployed any more. As far as I’ve seen, though Mr Osborne would like to point at isolated incidents of job creation and declare the country saved, the statistics don’t paint such a clear picture. The Low Pay Britain 2013 report indicates that though there are jobs, a two tier system is emerging that divides the country by employment sector and geography. The report flags up a “two-tier” workforce in which, in the second division, millions of people, especially women, young people under 30 and those outside London, regardless of skills and qualifications, are stuck in “feel-bad”, low-paid, part-time and temporary jobs, excluded from home ownership, career advancement and income security. In the top tier are those in managerial and professional jobs (finance, law, medicine, media and big business), a metropolitan elite who, throughout the recession and before, have accrued an ever expanding share of the national cake. To pull some Social Science theory into the mix we can also look at Daniel Bell’s concept of the Post-Industrial Society. Writing in the 1970s Bell believed that through increased automation and the role of information technology, society would change from one primarily concerned with manufacturing, to one that focused on information. This would lead to a change in society that required highly skilled workers able to work in the service sector, managing the creation and flow of information; a technical managerial elite. This entry was posted in Books, In the News, Social Science and tagged Conservative, Daniel Bell, Dystopia, Employment, Information Society, Osborne, Post-Industrial, Work Scheme by minyall. Bookmark the permalink.